Magician Lord (マジシャンロード Majishan Roodo? ), is a side-scrolling platform game developed by ADK that was released on April 26, 1990. It was a launch title for both the Neo-Geo MVS (arcade) and AES (home) systems, and was one of the pack-in games for the Neo-Geo AES. The game was re-released through the Virtual Console download service in Europe and Australia on October 26, 2007, and in North America on October 29, 2007. It was later released for the PlayStation 3 and PlayStation Portable through the PlayStation Store. It was previously included in SNK Arcade Classics Vol. 1, released for the Wii, PlayStation 2 and PlayStation Portable in North America on May 1, 2008. 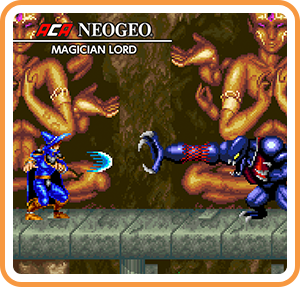 Where can I buy ACA NEOGEO MAGICIAN LORD physical/digital?